I don't really visit art museums when I travel. Hell, I rarely go to them when I'm at home. I guess I just have a short attention span when it comes to looking at paintings and sculptures. But when an artist finds a way to blend art and nature in a really cool way? Well, THEN I'm willing to reconsider. Before I went to Denver last weekend, a few people had told me to check out the city's Botanic Gardens. I filed that suggestion away, figuring maybe Elliot and I would go if the weather was nice and we didn't have anything else to do. 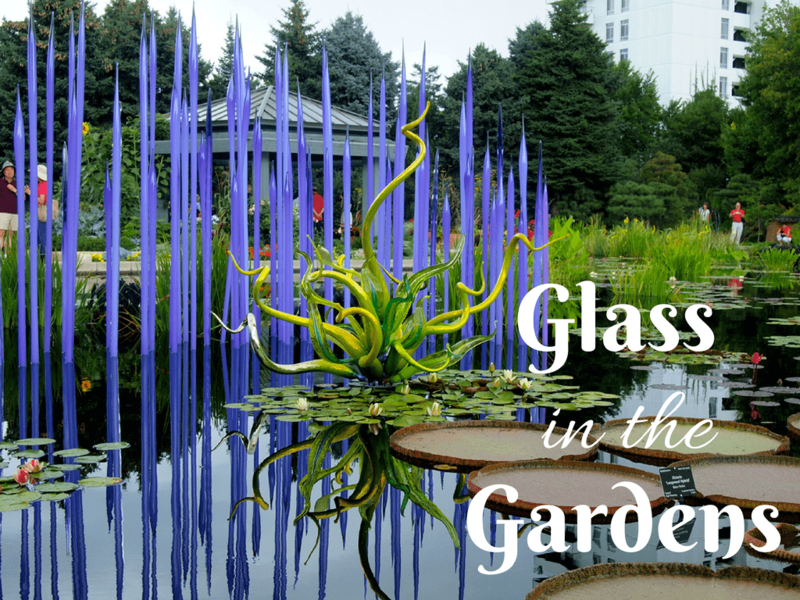 When I got to Denver, though, I learned that there was a Dale Chihuly exhibit on at the gardens. And you can't say no to ! In case you've never heard of this genius artist before, he works primarily in one medium: GLASS. A Washington native who looks kinda like a hippie-pirate with wild Einstein hair and an eye patch, Chihuly does incredible things with glass, blowing and bending it in ways you can't even imagine unless you see them. I've been a huge fan of Chihuly for years, ever since I first saw the Bellagio ceiling in Las Vegas (pictured above). I've also seen a few of his pieces that are housed at the Phipps Conservatory & Botanical Gardens in Pittsburgh — he had a large exhibit there in 2007/2008, and the Conservatory ended up purchasing some of the pieces to be housed permanently in the gardens, including a massive yellow chandelier. But I'd never seen a full-blown Chihuly exhibit. So, naturally a trip to the Denver Botanic Gardens shot to the top of my to-do list. The exhibit itself was like much of Chihuly's other work — it was woven in to the nature and gardens that were already there. Half the fun was roaming around, trying to find every piece, no matter how small. All I can say is, if you ever get the chance to see a Chihuly installation, DO IT! Which work of art is your favorite? Like I said, I’m not a huge fan of art and art museums, but Dale Chihuly definitely has to be one of my favorite artists! I find glass blowing so fascinating. Aren’t they, though?! I couldn’t stop taking photos. Woah! These pieces are stunning! What an incredibly cool installation! I’d never heard of it before. He does these all over the U.S. – I’m so glad I finally got to see a full one! This is something unique! Will get back to the post again once I get better internet connection. Yes, super unique! I love how different every piece is. Great photos, I can’t get over how vibrant the colors are! Yes, he uses so many bright colors! I concur! If you are ever in a city with an existing Dale Chihuly exhibit – GO SEE IT! I saw the one in Seattle and thought it was the most amazing thing. Ah.. I love Chihuly! It’s so worth it! I definitely need to see more of his stuff in Seattle! What talent!! How someone can do that with glass is amazing 🙂 simply beautiful. I know, right?? I have no idea how you even come up with some of these pieces, let alone actually make them! These are amazing! I adored your photo of the boat last week, but if anything the rest of the exhibition is even more amazing. The colours are simply stunning, and I love the reflections off the water. He certainly knows what he’s doing it when comes to colors and reflection! Those are absolutely amazing! So beautiful! I’m so glad we made time to go see this exhibit! I have to agree, Chihuly exhibits are amazing! I’ve seen his installations in Seattle and here in San Francisco and they never fail to blow my mind. It’s a must see for anyone who loves art! Thanks for sharing and posting these amazing images! I definitely want to see his Seattle exhibit sometime! We have a Chihuly exhibit going on at the Clinton Presidential Library right now. Ill have to go check it out. There is also a Christmas Tree that he donated to the Clintons in the Center as well. You definitely should, Heather! His stuff is very cool.